This walk is an excellent round which covers the best of Charmant Som, and it is strongly recommended. It is a long walk, but for the main it follows well constructed traditional paths and is easy going. The route starts from a little way up the Valombré road (map), below la Diat, makes its way up to the Col de la Charmette, swings round to ascend Charmant Som from the west, and returns to the car via Par les Dalles and le Collet. Although the summit of Charmant Som is a honey pot, most of the route is on small paths where you are unlikely to see many people. To find the parking place follow the D520b down the Gorge du Guiers Mort from la Diat. After 700 metres, immediately after the road crosses the river at the Pont du Grand Logis, a side road crosses the river again. Follow this for about 300 metres to a parking area for a dozen cars (780 m, grid ref. UTM 31T 71902 50250), just before a road barrier. We start by following the road up the valley, but this is no hardship as it's a beautiful valley and there is little traffic apart from the occasional monk pottering past in an ancient Fiat. After about 35 minutes, the Habert de la Malamille is passed. A few metres beyond the road turns to the right, and our track keeps straight on up the hill. A little way beyond a junction with a route to the left reached after ten minutes, the track develops into a path which ascends gently through the forest. As it climbs between the cliffs towards the col de la Cochette (1263 m), it develops into one of the best constructed paths in Chartreuse - a section of zigzags supported by dry stone walled banks. The path on the far side is equally well constructed, as zigzags descend a steep and narrow gully, with cliffs soaring up on both sides. At the base of the cliffs, the path diverges, with one continuing down the hill, and the other traversing the forested flanks to the left which we take. This is the the Chemin de la Cochette, and it starts off as a fairly thin undulating path. After a couple of kilometres it becomes a forest track before meeting a major junction with the Col de la Charmette a few minutes to the right, and the way to Charmant Som to the left, which is the way we follow. This track soon morphs into a path, and a few minutes later, starts to follow a stream bed in a ravine which follows the line of a geological strike-slip fault, passing some drinking troughs en route. Some twenty minutes after leaving the Chemin de la Couchette, the path leaves the forest to enter a lovely little valley, surrounded on three sides by cliffs, and wanders up the pasture to the left. After a further 20 minutes, you reach the first of two large shakeholes. The cattle have obscured the path at this point, but by rising up the flanks to the right, you'll soon pick it up again. 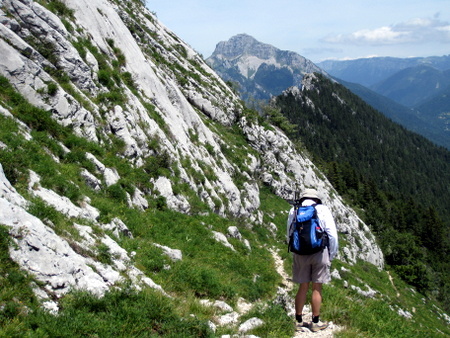 In about 10 minutes you'll reach a narrow ridge with superb views on both sides. The path meanders on and around the ridge for a quarter of an hour through a floral wonderland, before dropping slightly into a pasture. This leads towards a valley (the continuation of the one we ascended), with the main path descending a little before rising up to a terrace between cliffs on the far side. There is, however, a smaller path which branches off to the left towards the head of the valley, which is the one we need. It is marked with green and red way markings. We once saw some chamois (Rupicapra rupicapra cartusiana) grazing in this area. Once round the head of the valley, the path rises steeply, and we rather abruptly arrive at the summit (1867 m), some four hours after leaving the car. After the solitary ascent, the crowds on the summit will come as a somewhat rude shock. At weekends, it's a major exercise to negotiate one's way round the vast groups who are having photographs taken to celebrate their successful 200 m ascent from the upper car park. One can find a quiet corner, however, and there are worse spots to have lunch. The views are splendid. Chamechaude dominates to the south-east, and with a pair of binoculars you can pick out the traverse through the cliffs from le Jardin. To the north, you can see the monastery nestling beneath the dramatic western cliffs of the Grand Som. By moving along the ridge to the north for a few metres, you can get an impression of the splendid cliffs lying beneath you. To the west, you can see across the col de la Charmette to la Grande Sure. The descent route initially heads towards le Colet, to the north of the summit. Follow the track down the south ridge towards the car park, and from a small col reached after ten minutes, take the path off to the left. This descends a shallow valley, to soon reach a T-junction (1750 m). This is the ubiquitous Tour de Chartreuse: turning right leads to the summit car park; we turn left. This follows the superb Par les Dalles, which picks its way across the rocky eastern face which is so prominent from la Martinière. Beyond this, the path follows a line under the ridge, passing within 20 m of the entrance to Puit Kriska, at 780 m the deepest cave in Chartreuse, until an obvious junction is reached at a col on the north-east ridge - le Collet (1562 m). Turn left down the path descending the north side of the ridge. After a couple of minutes, there is a distinct junction, with the way to the left descending into the valley. We, however, take the right path which follows an attractive line across open slopes beneath the impressive cliffs of the Arête de Bérard. From here there are good views of the monastery, and we have seen monks walking on this path. Eventually, the path swings away from the cliffs and descends sweeping zigzags through the forest to the Valombré road. Turn left, and within two minutes you'll find yourself back at the car.